Princess Catherine Castlehoff is regally dressed in purple and gold. 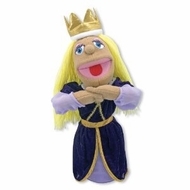 This unique royal puppet features elegant hand detailing and materials carefully crafted for years of pretend play! Measures 16.5" x 7" x 4.5".